Basically it says we are probably going to screw you out of the card in the box that you were looking for. I was hoping against hope that this wouldn’t be the case, but this note was a dead giveaway. So now, I have to pay shipping on a birthday gift. If I wanted to do that, I would’ve put this money in the bank and bought a box online. I wanted instant gratification. Bad news aside, I did like the rest of the cards in the box. Even though I didn’t get flashy players for the numbered cards, I did like how they fell to almost one a pack. I even got one a numbered card in a pack with one of my hits. The cards ranged from 249 to 999. The autograph that I did get is a current Panther. He isn’t playing right now the team gave up a draft pick for him so they will inevitably give him a chance to stick. The Bronco swatch is Julius Thomas. I can’t get past the fact that I got points instead of a hit. I have never had rewards points so I hope the shipping isn’t too bad. I am very disappointed in this box. This week’s Bid Board Finds has to be the mother-load compared to past posts. A lot of it has to do with bidding 28 hours before the bid board ended; as opposed to the usually 100 or so hours that I normally do. This weeks haul was $16.25 for 14 cards. These cards are best broken up in 2 categories: Steelers and non Steelers. I am not a Steelers fan but in comparison with others this is my favorite load because of the value. Steelers players have a lot of trade value because of how popular they are. There is really only 1 card in the Steelers lot that I would consider untouchable in terms of my PC. The 3 non Steelers are all PC cards. Lawrence Timmons autograph – this is the second Timmons autograph in my collection and I am not a fan of them. I hate how he took the easy way out and only signed LT.
Ben Roethlisberger uncirculated, limited to 750 – uncirculated cards under appreciated in today’s card market. I wasn’t a fan of them when they were around but now that they are gone, I miss them. Two quick one off finds from 2 different bid boards. One from my favorite card shop, Valley Sports Cards, and the other from the one near my college. First up is Roman Reigns event used shirt that I got from Valley Sports Cards. The price was negligible as I payed under a dollar. I don’t get to highlight their bid board much because I don’t go in there for their bid board. I was ecstatic to get this as Reigns will probably win the WWE Championship this weekend at Survivor Series. These cards don’t go for much but I feel like I got an absolute steal; as similar cards from WWE champions fetch $10. The other find is an Andre Ellington autograph from my usually place. I am not going to say how much I paid for it because I didn’t keep the card. I sent it to a super collector as a thank you for being amazing to the hobby. Speaking of which, I should do something for Alex at Valley Sports Cards. As someone with PTSD, there are very few places where I can find peace when I need it. Since I am not coaching this season, I have 3 places that I can go. One of those places is my favorite card shop. I have covered in the past how I hate mystery packs. They never give value and a lot of the people selling them are unethical. Fortunately not everyone is like that, because my favorite card shop has mystery packs that have really paid off for me. 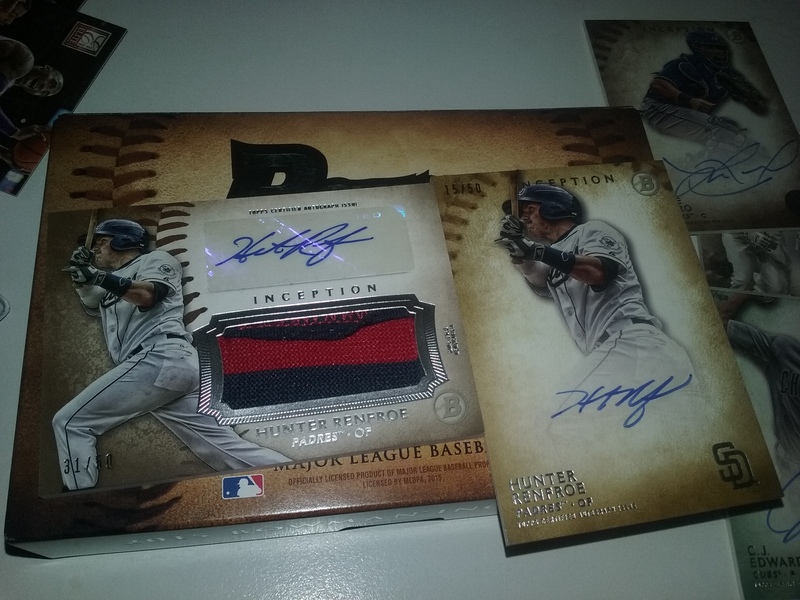 Here is how Alex at Valley Sports Cards does it. He puts together packs for 10 bucks from one sport. Each pack includes 2 relics, several rookie cards, a raffle ticket, and a board of death. On top of that, he has cards in his display case that say 1st, 2nd, and 3rd prize. Right now for basketball there is a Scottie Pippen autograph as 1st prize for the basketball packs. The thing with that board of death is that in a handful of packs there is prize message on there saying that you won 1st prize (or 2nd or 3rd). He holds about 2 raffles a year. They are like big parties where he celebrates his customers and rewards them. He raffles good stuff like Jordan, Kershaw, and Magic Johnson autographs. There are customers that come acting like they are entitled to win everything, but Alex (and his wife who is just as amazing) take such good care of his customers that the appreciation is a 2 way street for 99.9% of the customers. I won a Pau Gasol signed basketball from one of the raffles, thanks to all the tickets that I had compiled from his mystery packs. I love buying these packs because Alex does not put junk in there. Among the highlights of cards that I have got in the packs alone: Bobby Doer autograph, Wade Boggs jersey, Sam Bradford dual jersey, piece of a Super Bowl pylon, etc. Not all are great, but that is very rare. There are days when I walk away thinking that I got a dud pack but those days are pretty rare. I have bought so many packs and won some good stuff: Bob Griese autograph, Steve Young autograph, Alex Rodriguez booklet, etc. As a low end collector, I hate walking into his shop with only dollar bin items so I try to buy one every time that I come in as reciprocation for how well Alex and his wife have treated me over time. I am not going to lie, I look at the prizes showcased to see if there is anything good; but very rarely is buying those my single reason for buying one of the packs. As a low end collector, I really don’t get to open any high end products unless they are old and thus cheap. 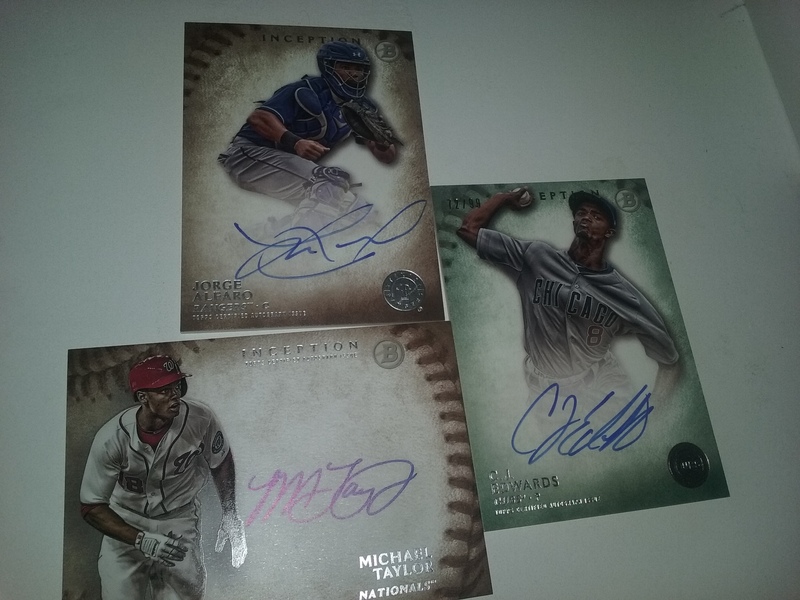 I got lucky several months ago and won a contest where I had to guess to score of a baseball game and came away with a Bowman Inception box. I was waiting for a good time to open the box. After the Target fiasco, as seen in the last post, I really needed a pick me up. Unfortunately this box wasn’t it. The product features 5 cards, all of which are at the very minimum autographs. That is not an oversight, I really did get two Hunter Renfroe cards that were numbered to 50. This box just turned him into one of my favorite players. The patch card kind of annoys me as a collector because it has pieces of the jersey hanging out; I just wish that there was more quality control. The cards themselves are on good stock and should be durable over time. There were a few minor dings on the cards but that is because they gave too much breathing room for the pack of cards in the box; a nitpick on my part. The only real issue is that these cards are thick and don’t fit into common top-loaders. Unfortunately all of these cards can be bought on Ebay right now for under $12 for all. I would say that means the box is a major dud. This is why I avoid prospect boxes. I did a little research because these are my new favorite players. Renfroe is listed as high as the Padres #3 prospect currently; although that may change with the Kimbrel haul. Alfaro was a key prospect in the Cole Hamels haul. I am very familiar with him, and his autograph is my personal favorite of the box. I saw Mike Piazza develop when I was a kid going to Dodgers games, so I am partial to power hitting catchers. Baseball America has him listed at the Phillies 5th best prospect. Edwards saw the Cubs big club this season but my gut tells me that he will flush out soon; although I hope not. He came to them from Texas in the Matt Garza trade. Taylor played regularly for the Nationals and put up an atrocious batting average. I hope that they give him a chance to show that it is a fluke; it will help if Denard Span leaves via free agency. He should get that chance because he peaked at the #32 prospect in all of baseball before last season. Coming up in my next entry, my luck did change with a visit to my favorite hobby shop. For my birthday, I recieved $50 to Target from my sister. I annihilated it in one purchase. I bought 4 blaster boxes and 1 Fairfield box. So Friday was my birthday and like your typical card collector, I wanted only one thing for my birthday. I wanted a box of cards. Normally this means that I get blaster boxes from Target or Wal-Mart but this year was different. My great mother who reads this site, hi mom, knew that I was down on blaster boxes. She offered to go with me to my favorite card shop, Valley Sports Cards, and buy me a box of cards. Despite turning 30, I had no qualms about walking into the card shop with my mom. Hey, I love cards because opening a pack makes me feel giddy like a little kid. I immediately picked out Donruss Elite 2012/13.